Tell us a little about Estate Gardening and the sort of service your business provides. Estate Gardening is a design and maintenance business specialising in servicing large domestic and commercial properties. Over the years, the business has also diverged into retail, trading as, “Gardenacious” selling professional-grade garden tools online as well as at garden shows. 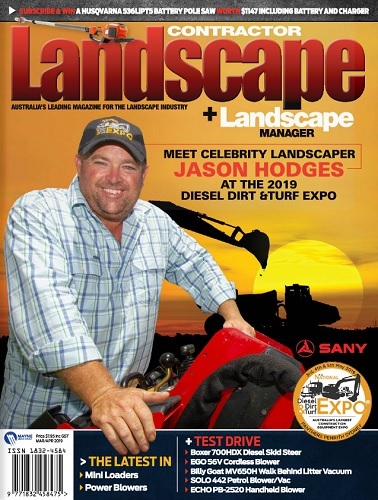 Have you always been in the landscape industry? I started out in secondary teaching while studying horticulture at nights. After returning from a stint of teaching overseas, I decided “to use my hands as well as my brain” establishing, Estate Gardening. What do you most enjoy about your job? For me, the most enjoyable times on the job are early morning and late afternoon. The early morning discoveries of vibrant new shoots after planting or pruning and the late afternoon survey of a job well done, a landscape brought back together. What are some of the things you think are important to the success of a business in this industry? Above all, business success revolves around professionalism – I firmly believe that when you start out in business, from day one you should look and act like the business you want to become. When my wife and I came up with the name “Estate Gardening” all those years ago, we wanted to work on large gardens or estates, yet we started out mowing lawns and doing small domestic makeovers. But, from day one, we had the training and knowledge behind us, gave detailed quotes, listened to our clients giving advice but also admitting when we didn’t know the answer,worked hard and were kitted out with good uniforms, equipment and a work vehicle. Why did you buy a Trafic, and what do you like best about it? A van, like the Trafic, really suits our work because we can lock up our equipment even long pole saws, and still have room to protect and carry plants for the job. As we can often be loaded to the roof, the added torque of a diesel motor was also important. There’s nothing better than, at the end of a slogging day with a long drive home, to be able to put on the air-con, set cruise control, hit iTunes, relax and wind-down! Our dual turbo diesel easily keeps up on the motorways while delivering fuel consumption of a miserly 6.5l/100km. How did you come to the conclusion that the Trafic was right for your business? Like anyone in small business, a new vehicle purchase is a significant investment, so we did our research, looking at road tests and specifications of all the major players, coming to the conclusion that the Trafic was perfect for our business. Emission laws across Europe have meant that European manufacturers, like Renault, have had to continually innovate and upgrade, coming up with more powerful, fuel-efficient motors. Some of the Asian manufacturers continue to run with old motors and running gear, just making minor cosmetic changes between models. How could the buying experience have been improved for you? We were very happy with Dominelli Renault in Kirrawee. They made the buying experience easy, all our questions were expertly answered. How could Renault add more value to your ownership experience? We’ve had good follow-up from the dealer but, to further improve our ownership experience, Renault Australia may like to look at a commercial owners e-magazine detailing test drives, owners’ experiences, new releases and servicing. What’s generally more important to you – price or convenience? To me, price and convenience are both important. My Renault van wasn’t the cheapest nor the most expensive option but, the convenience of 30,000km servicing along with an incredibly comfortable, purpose-built work space got me across the line. What does the future look like for your business? And your industry? I’m quickly becoming an “older statesmen” in horticulture as I reduce my workload going into more managerial, consultative work. Yet, the increasing demands placed on our environment will continue to lead to more work for those in the landscape industry. One of the current catch cries is biophilia and biophilic design – that humans have an innate need to be connected to nature. The landscape industry is able to provide that connection between urban architecture and the natural environment.